Do you want a NEW designer wedding dress without the original manufacturer’s retail sales price? We have gathered together hundreds of dresses from bridal stores across the Midwest area and drastically reduced their price. This year we also have bridesmaids and flower girl dresses. 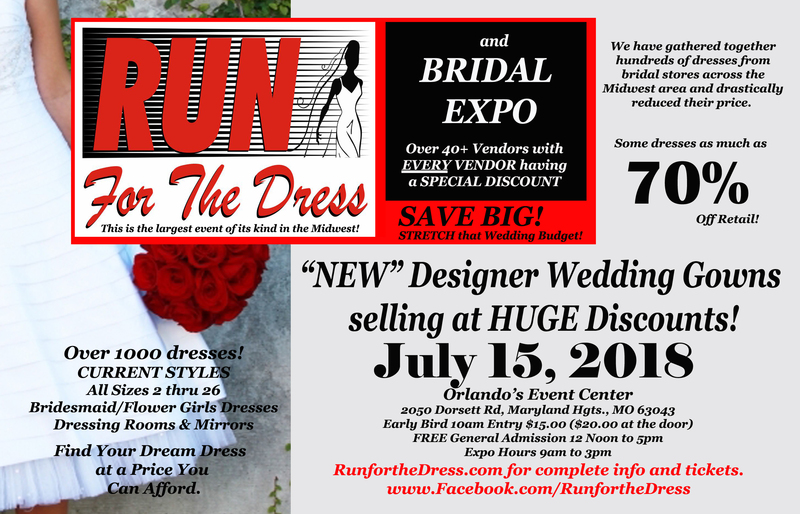 Save your money for other wedding expenditures and come to the Run for the Dress at Orlando’s Event Center, 2050 Dorsett Road, Maryland Heights, MO 63043 on July 15, 2018. The early bird gets the worm, or the best deal! This is the largest event of its kind in the Midwest! We have all sizes from 2 through 26, plus we have 10 dressing rooms and mirrors. Early Bird Entry at 10am ($15.00 purchased online and $20.00 at the door.) and FREE Admission at 12 Noon to 5pm. Last year we had brides come from over 8 states! The deals are just that good! And this year we have MORE GREAT DEALS! A bridal expo will be held at the same time starting at 9AM until 3pm and EVERY VENDOR will be offering a discount on their product or service. When you check in at the registration desk you will get a ticket to hold your place in line and you can go shop at the bridal expo while you wait for the Dress Sale to begin. The Bridal Expo starts at 9am. Learn more – See a video from last year’s event and look at some of the beautiful dresses that will be available. Additional details can be found at www.RunfortheDress.com or our Facebook page, www.Facebook.com/RunfortheDress. Find YOUR Dream Dress at a Price You Can Afford!